Activity Summary: Eruptive activity continues at Kīlauea Volcano’s summit and East Rift Zone. 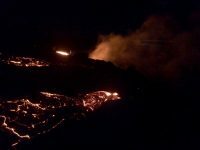 The 61G lava flow extending southeast of Puʻu ʻŌʻō entered the ocean, as of 1:12 a.m. HST, but poses no threat to nearby communities. The lava lake at Halemaʻumaʻu Crater continues to circulate and intermittently spatter. Seismicity and deformation rates throughout the volcano remain at background levels. Summit Observations: The lava lake within the Halemaʻumaʻu Overlook crater remains active. The depth to the lake was estimated at 25.5 m (84 ft) below the crater rim, measured on Sunday. 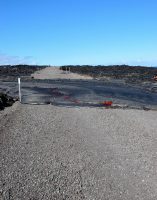 Tiltmeters at Kīlauea’s summit recorded flat tilt. Seismicity is within normal, background rates with tremor fluctuations associated with lava lake spattering. The summit sulfur dioxide emission rate ranged from 2,400 to 5,000 metric tons/day. Puʻu ʻŌʻō Observations: Webcam images over the past 24 hours show persistent glow at long-term sources within the crater. There were no significant changes in seismicity or tilt over the past 24 hours. The sulfur dioxide emission rate from all East Rift Zone vents on July 25 was about 280 metric tons/day. Lava Flow Observations: The 61G lava flow extending southeast of Puʻu ʻŌʻō towards the coastal plain on Kīlauea’s south flank remains active. The 61G lava flow extending southeast of Puʻu ʻŌʻō entered the ocean, as of as of 1:12 a.m. HST, last night. Areas of incandescence remain visible in overnight webcam views of the active lava flow field, marking lava tube skylights and areas of active lava on the pali and along the flow as it extends towards the coast. 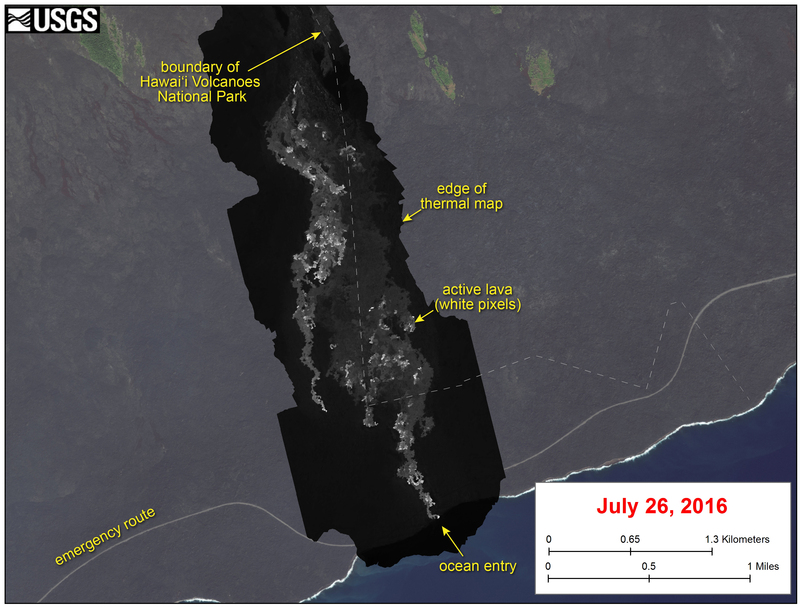 This map shows recent changes to Kīlauea’s East Rift Zone lava flow field. The area of the active flow field as of July 19 is shown in pink, while widening and advancement of the active flow as mapped on July 26 is shown in red. Lava reached the ocean on the morning of July 26. 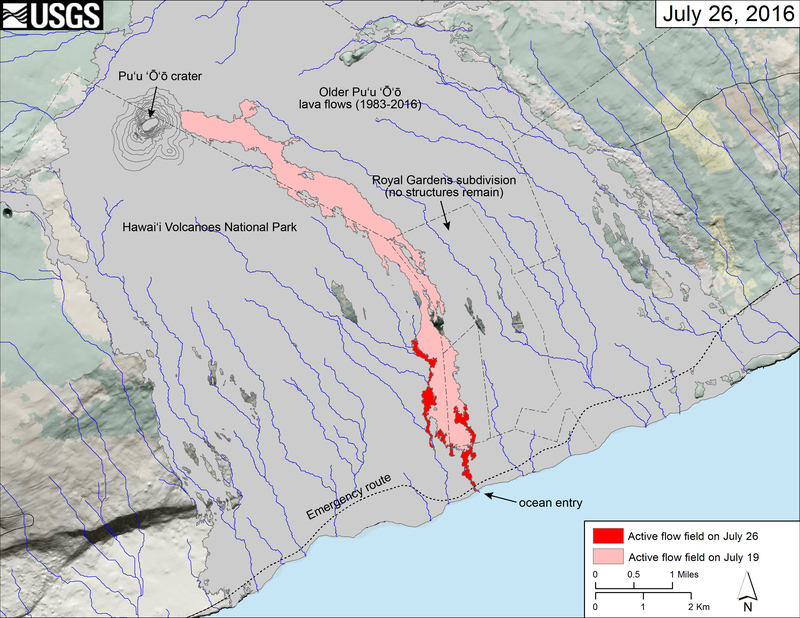 Older Puʻu ʻŌʻō lava flows (1983–2016) are shown in gray. The thermal map shows scattered pāhoehoe breakouts on the coastal plain, with a narrow lobe of lava crossing the gravel road and extending to the ocean. In addition, a narrow lobe was advancing along the western margin of the flow on the coastal plain.